Euroquatics, a wholly owned subsidiary of horticultural lighting giant Gavita Holland, and Transcend Lighting, the world leader in LED grow light technology, are pleased to announce the new E5 aquarium light lamps are now available through MarineDepot.com. 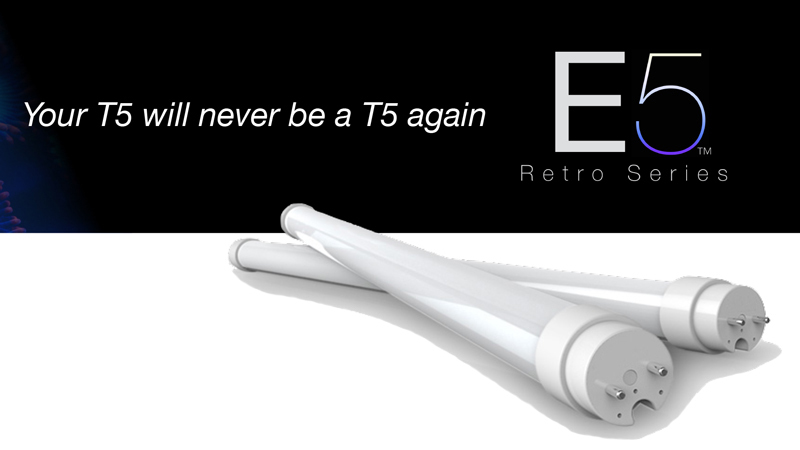 The highly efficient E5 lamps are designed to work in sync with original T5HO fixtures. These unique products showcase features that create an eco-friendly aquarium lamp that lasts up to five times the life span of an average T5HO lamp while consuming about half of the power. While normal T5 lamps are comprised of toxic materials that could be harmful to the environment, the E5s are made to the highest industry standard from recyclable materials. These custom-phosphor LED technology lamps are RoHS, (Restriction of Hazardous Substances) compliant and do not contain mercury or other toxic materials. E5 lamps are available in four standard sizes: 2’, 3’, 4’ and 5’ and currently have four color options to choose from on MarineDepot.com. These include Warm Daylight, Daylight, Cool Daylight, and Blue Pop (450nm). Founded in 2014, Euroquatics specializes in user-friendly, professional-grade LED reef and marine aquarium lighting systems. Backed by European horticultural lighting giant Gavita, the company was started with the goal of designing and building advanced aquarium lights that make it easy to achieve professional-quality results without hours of setup time or complex maintenance and usage tasks. At Euroquatics, it’s about creating better aquariums through innovation – allowing hobbyists to enjoy what’s in their tank, rather than what’s on it. To learn more, visit euroquatics.com or follow the company on Facebook.